Well, look what came home with me from my latest foray to the Williams-Sonoma class the other weekend. The Cook and the Butcher cookbook somehow followed me home and flipped open to a delicious looking "flap steak" recipe and voila...Sunday dinner! 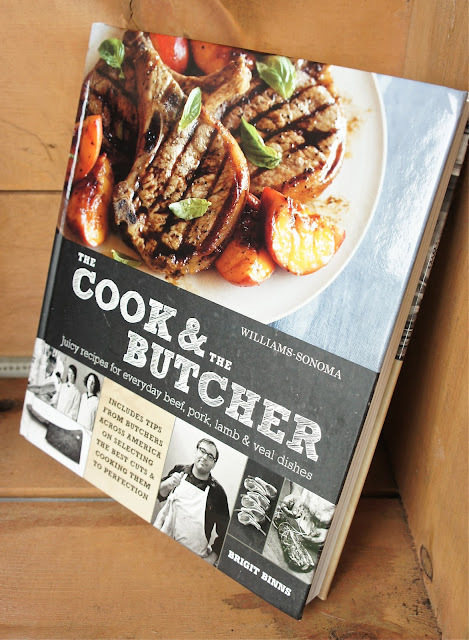 This cookbook is written by Brigit Binns for Williams-Sonoma. What I like about it is that each chapter is designed to educate novice chefs like me from the perspective of butchers. I haven't devoured it from cover to cover yet. To be honest, I am a little intimidated. I get really confused by all of the names of beef as well as the varieties of cooking methods. I can tell, though, that this book is going to sort it all out. Patrick and I were in Dallas a few weekends ago. We went to meet his brother's fiance. She is from Mexico and made us the most delicious, authentic breakfast soft tacos. I thought I would just eat one and ended up eating three (piggish...I know. Thats why we are food bloggers). Well, the next William-Sonoma class was covering meats and grilling. How timely because I wanted to duplicate the delicious flavors of the beef we had in Dallas. The smell in the store drove everyone beserk it was so aromatic. Our adorable chef, Jill, caramelized onions for us to sample alongside the meats she cooked. I especially liked the ease and flavor of skirt steak. Whole Foods was out of skirt steak and the butcher said "flap" steak would work just as well. I am now getting acquainted with my butcher at Whole Foods. Isn't that great? You know how you always hear "Just ask your butcher this question...or that question". Ha! I couldn't even imagine a grocery store butcher taking time with me. However, I have started talking with the people at Whole Foods in the meat as well as seafood department and they are so wonderful! Really! In addition to this hefty new grilling cookbook making its way home with me, I also bought what I consider to be the best cooking purchase ever! I picked up the new All-Clad "instant read thermometer". This is a great tool for grilling meats. We used it on the leg of lamb the other day and it worked beautifully. The fear of over-cooking or under cooking meat has often made me pass on trying out a recipe. In fact, M. has been down with a cold for a few days now. I considered telling her to pop this meat thermometer in her mouth so we could figure out if she had a fever. I didn't do it. You know, she is a teenager and all. My humor just doesn't seem to work well on the teenage variety. A dry rub we have tried out since moving to Texas has quickly become our favorite. Its called "Rub Grub". Yep. Its Texan alright. This rub is amazing on barbeque. I seasoned the flap steak with this before it went on the grill. Delicious. Time to get serious and dig into this new cookbook and learn more about beef selections. I do know one 4-legged creature that certainly was thrilled with this new cookbook find. His name is Chester and he is hoping that I read it from cover to cover and apply any newfound learning. Often. I know your not supposed to feed your pets table scraps. But look at that face! Place the steak in a nonreactive baking dish. Brush both sides with the oil and season generously with salt and pepper (and Rub Grub). Cover with plastic wrap and refrigerate for at least 1 hour or up to 6 hours. 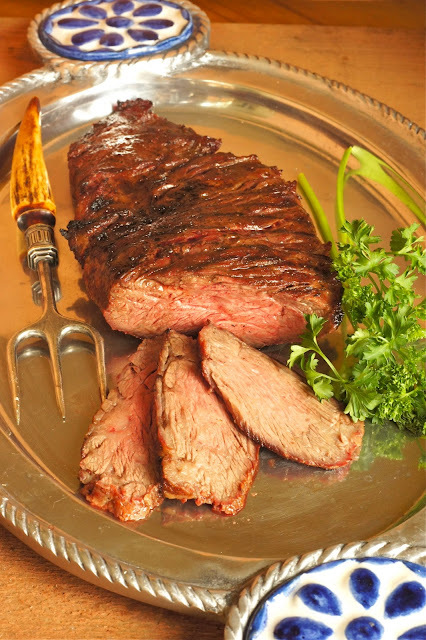 Remove the steak from the refrigerator and let stand at room temperature for about 45 minutes. Prepare a charcoal or gas grill for direct-heat grilling over high heat, or preheat a cast-iron stove top grill pan over high heat. Place the steak on the grill rack over the hottest part of the fire or in the grill pan, and cook without moving it for about 1 1/2 minutes. Turn and cook until an instant-read thermometer inserted into the steak registers 130º-135ºF (54º-57ºC) for medium-rare, 1-3 minutes more, or to your desired doneness. Transfer the steak to a platter and let rest, loosely covered, for about 5 minutes. Cut the steak across the grain and on the diagonal into the slices and about 1/2 inch (12mm) thick. 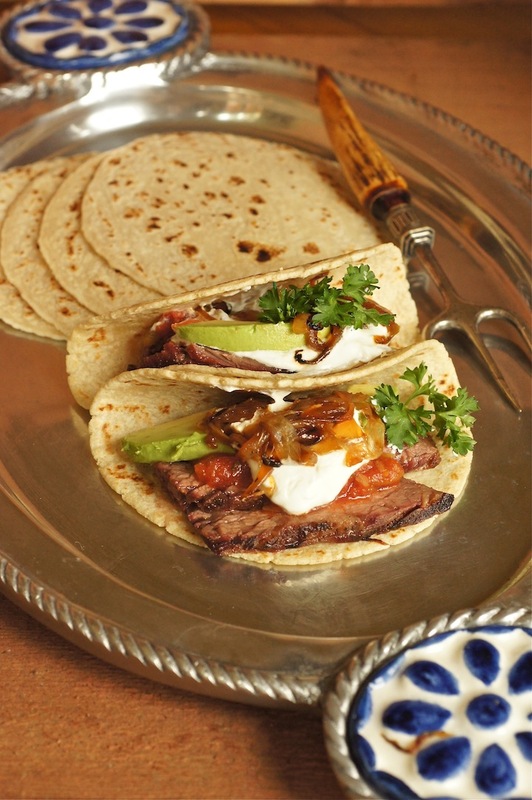 Arrange toppings and heat soft tacos and serve!